CHAIRMAN MEOW HAS A NEW SITE! I am Chairman Meow, Leader of the Feline Revolution! My basic principles are embraced by Meowists worldwide. 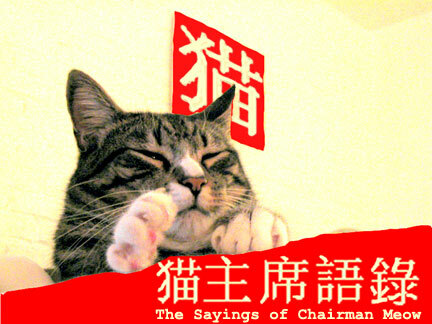 A collection of my speeches and writings can be found in The Sayings of Chairman Meow, commonly known as The Little Cat Book. It is one of the most popular and extensively-studied books in the world, and millions of copies are in circulation. Here are some excerpts. Please read them carefully, and apply them to each aspect of your life. Enjoy!